Three days remained until Christmas, but Missoula was low on December snow. The only remnants of the snow that fell a few weeks earlier were chunky, crusty patches that survived in shadier parts of fields and yards. Hard to picture anyone dashing through the snow in a one-horse open sleigh along the Kim Williams Trail. But friends said the snow was better up high, where the peaks caught the clouds, which surrendered a bit of their frosty loads. 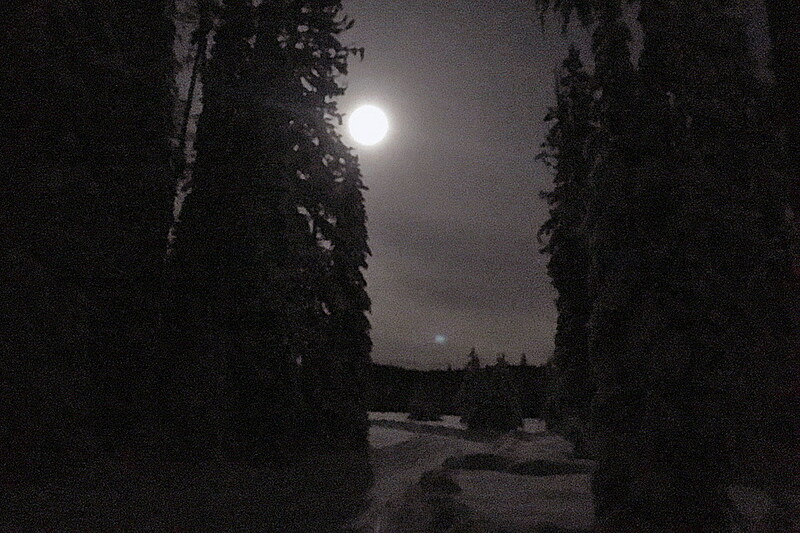 So I looked forward to attending the Full Moon Event on Dec. 22 at the Lolo Pass Visitor Center hosted by the Nez-Perce Clearwater National Forest. Just a day after the Winter Solstice, Saturday coincided not only with December’s full moon but also the Ursid meteor shower. Nature promised a good show for those who made the winding drive up the mountain. The Visitor Center normally closes at 5 p.m., but the Forest Service was extending the hours and keeping the warming hut and restrooms open until 8:30 Pacific Time so people could ski the groomed trails for a few hours under the full moon. In the hut, they also offered ingredients for good cheer: hot chocolate, ornament making and music. But the government shutdown of Dec. 21 threw a Grinch-like shadow over the festivities. Disappointed locals posted to the Lolo Pass Visitor Center Facebook page, asking if the event was off and if the warming hut would be closed. Initially, they got no answer. Turns out that even the employees didn’t know what would happen for a day or so. On Saturday, the national forest regional supervisor told visitor center employees that the event was to go ahead as planned, according to one of the employees. After the word spread Saturday via social media and returned phone calls, more than 100 people showed up with snowshoes, skis and smiles as the sky darkened beyond the Bitterroot Mountains. Inside the warming hut, Forest Service employees chatted with visitors and kept the woodstove roaring. Several people thanked the employees for being there. We kept a steady pace, skis softly swooshing and our poles puncturing the snow with repeated squeaks. Then stopping to gaze on Mount Fuji and the swath of white that glowed on Packer Meadow, we stood still to take it all in and listened to the silence. “The astrology of this moon is that it’s time to make up for arguments,” said my friend Terry. That seemed significant this year, one that seemed dominated by national arguments and conflict. 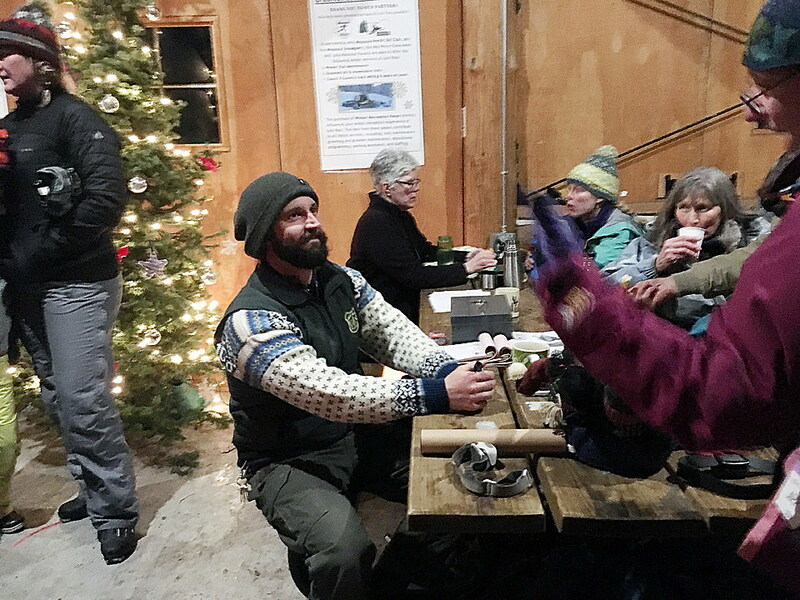 Inside the warming hut, three Forest Service employees weren’t getting paid to help people enjoy their public lands and feel happy around Christmas. They are just a few of the 800,000 federal employees who won’t get paychecks until the Trump administration reconsiders its position on the wall at the Mexican border. These employees may not have been prepared to go without pay for long. Some people splurge a little more at Christmas. Rent and other bills will be due after Jan. 1. With no resolution in sight, some are starting to worry. Meanwhile, land managers are trying to limit the negative effect on the public. Glacier National Park remains open to visitors, although visitor centers and restrooms are closed. In other states, state governments are providing money to keep national parks open. They know how much people value their parks. For example, a May 2018 poll by the University of Montana showed a majority of Montanans treasures wilderness, national monuments and public land issues in general. As 2019 approaches, more people, especially leaders, should consider finding better solutions to arguments, especially if they diminish federal lands and employees. It seems it would better benefit the public.